Combining old and new furniture is a must! The old classics have their own charm. If you love old buildings, wooden beams, original tiling and antique moldings, but you also have a passion for contemporary design and modern design, that's not a problem. You can follow your two passions and you will find the most surprising result. In fact, there is nothing quite like an old apartment decorated with modern furnishings to create a stunning contrast and develop a fabulous interior that combines old charm with the beauty of the modern. If this is your style, then go ahead and look at this ideabook where there are wonderful ideas that show you how to furnish an old interior space with new modern furniture. You can find the best solutions to achieve a spectacular connection between the modern feel and the old charm. 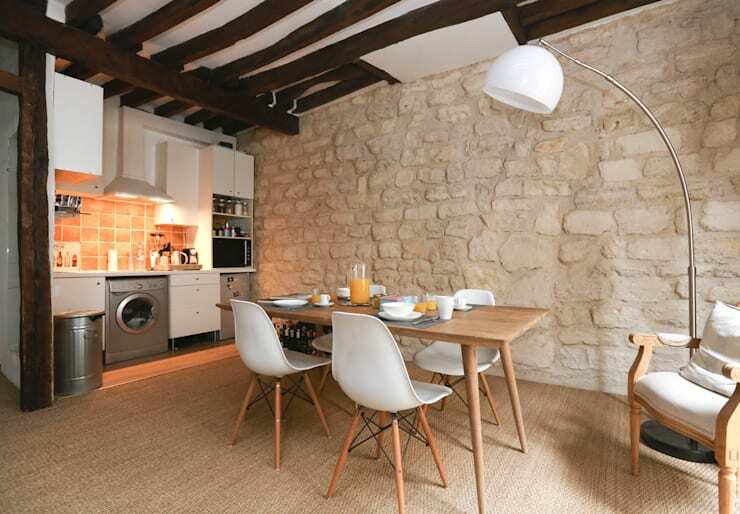 In this design, by Xavier Lemoine Decoration, we can show you how decorating an old apartment with beautiful stones and exposed beams, brings in elements of modern style of decorating. The light wooden table and white chairs as well as the lamps and the kitchen elements are all very contemporary, creating a counterpoint that works well with the stone walls and beamed ceiling. Interior design harmony is created by the soft warm tones of the furniture, which are reminiscent of the stone walls. Antique and modern are coherent and harmonious. The rehabilitation of this old mill perfectly embodies the aesthetic success that emerges when there is an alliance between the ancient and the modern. 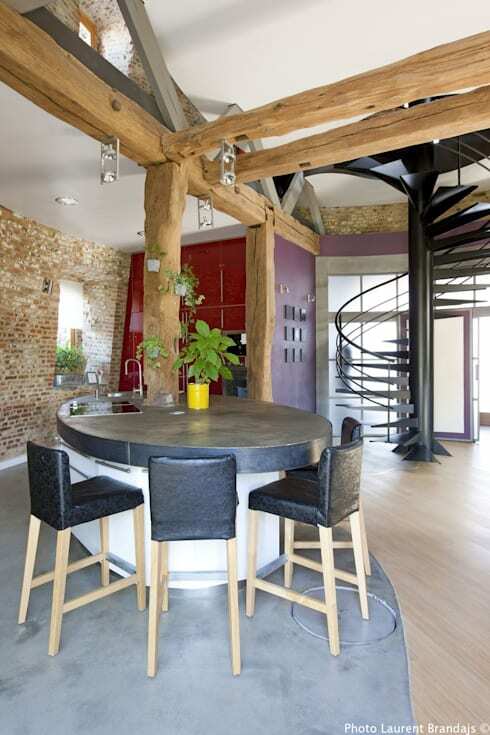 Here contemporary interior design makes up the structure of the mill. The raw materials, such as stone walls and wooden beams, form a beautiful contrast with the contemporary furniture and the ancient structure, adding a touch of modernity. The metal staircase is our favourite feature, uniting the upper storey with the lower storey. It also adds a beautiful design, by Draw & Do, to the original structure. Often, the old-school fireplace and the parquet flooring, creates some of the greatest treasures in old apartments. Whatever you do, do not get rid of these old wonders because they can help to create a completely modern interior. The contrast between the old floors and fireplace and contemporary furniture create an even greater choice of materials and give the whole design a new element. This is exactly what happened in this design, by New Home Agency. 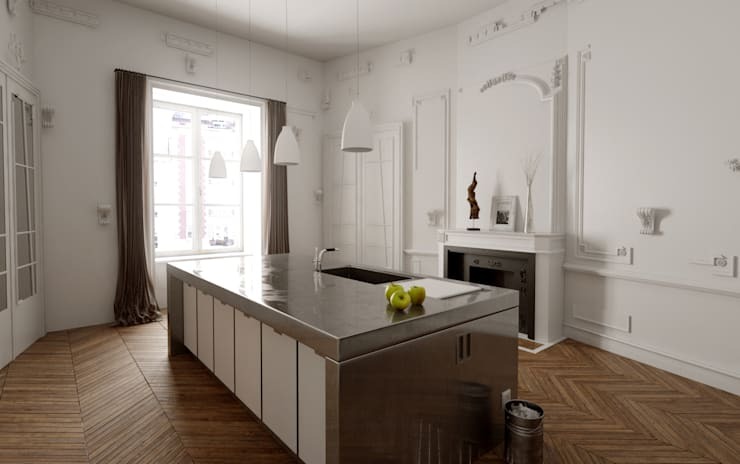 The kitchen combines a central island with modern metal lamps and hardwood, parquet flooring as well as the fireplace and the original moldings. It is precisely this alliance between the opposites which gives charm to this kitchen, combining the beauty of the old and the modern. This is a true success to inspire! In this room, we find the perfect integration of the old and modern. In fact, wooden floors and the original fireplace have been preserved, giving a unique charm to this room. On the other hand, the chair and the lights provide a modern edge, complementing the old decor with a modern twist. 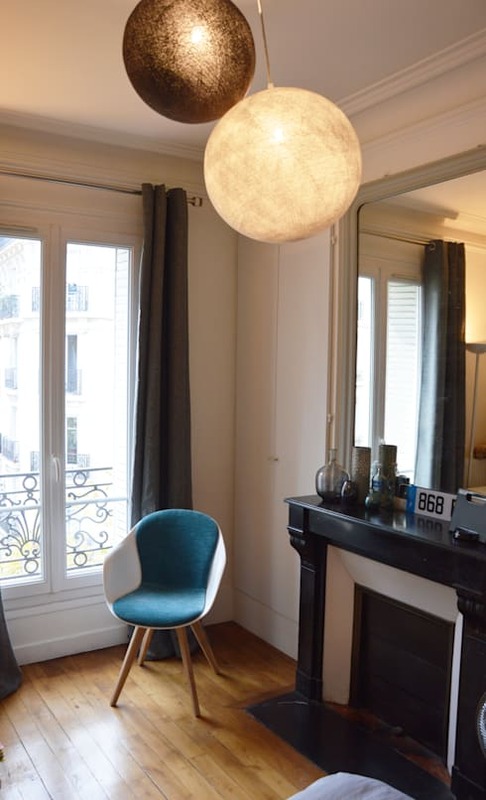 The result, in this design by Parisdinterieur, is a room with gray and blue tones that beautifully portray the original allure of this old Parisian apartment. Have a look through our fireplace products for ideas for your own home! While it is common for many rooms in the home to retain elements from the past—thanks to the floor, moldings or fireplace—it is much more difficult to achieve this in the bathroom. Getting the mix of old and new in the bathroom can be tricky. During the renovation of this old mill house, Draw & Do have chosen to incorporate the old structure of the house into the new bathroom. 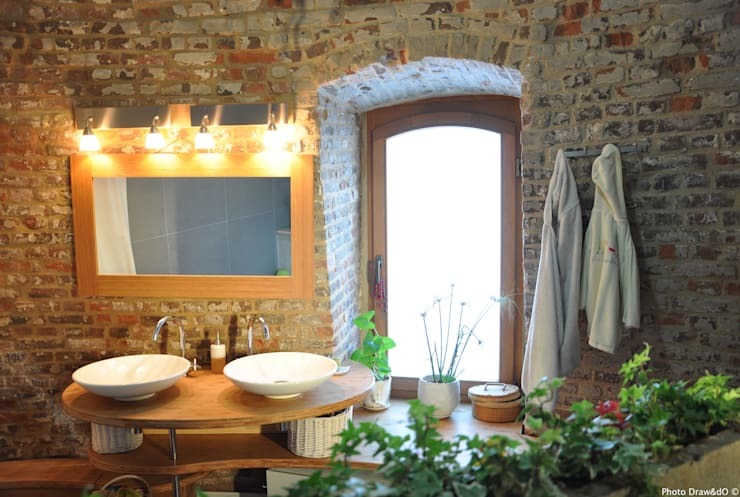 The stone walls in the bathroom are very prominent. This is a jewel of a design, allowing for a touch of the old while the bathroom is still very modern and very functional. The design also works perfectly with the curved lines of the stone bathroom. If you look at the design and the practical features, nothing has been left out of this atypical bathroom, with walls that are the source of the charm. When it comes to merging modernity and practicality together with the old work of a home, you need to select those elements that you want to keep and the ones that you want to add. In this project, you can see how the beams have been preserved but have been repainted, brightening the room. Similarly the fireplace, which was quite subtle and charmless has been transformed, while the wall has been turned into a custom library integrated with the fireplace. This shows us how it is possible to keep the old, while creating a modern and functional look. If you like this ideabook, you may like these ideas on how to style your home like a Scandinavian. What did you think these designs? Do you like the combination of styles? Tell us in the comments!